Windshield Wiper/Vacuum Tubing 9/32" x 50' BOWES HO VH36102. 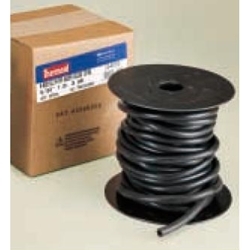 Low pressure EPDM tubing for windshield washers, vacuum and emissions systems for power accessories. Similar to SAE J1037 specification. Will not deteriorate from heat, weathering, or ozone. Maintains its flexibility even at low temperatures.